This is how I left the room today, set up for a sub who gets to do the “fun stuff” with the kiddos. 🙂 I try to keep a few tricks up my sleeve just in case, and today it was necessary to pull a few of them out. Tomorrow, Grant has a surgery to repair a hand damaged at work earlier in the week. Should be an “easy” fix and he should be fine, but just in case I thought I should be there. So I took a few pics of the classroom. Here are a couple. I am not commenting on them individually since they are relatively standard schoolroom pics, but the room is looking more and more lived in. The large leaves hanging from the ceiling are felt. I got them at a local large kitchen and bath store, and they have really made the room feel less cavernous. I rammed my foot up against an immovable object this afternoon. Will be teaching with a broken toe for a while. Which I can do, but it’s not going to be fun. Crutches on standby, ugly but comfortable shoes at the ready! It was a lovely, grey-infused day today. I like the gentle, seasonally productive, rains. It’s not so dark when the silver sun is falling. I have done very little that is productive since I hurt my toe. Stuck with my foot elevated, tired of sitting. Will have to get up and get some of the materials I need for the coming week in order. This week I will have a chance to teach a lesson on figurative language, and another an art-social studies lesson that will encourage discussion about perspective taking and decision making. I will get to talk about math, science, and a host of other topics that I find interesting. While the elder stidkid stays in town with a friend for a few days so we don’t have to worry about coordinating schedules around school-work/school-work/school/work, I hope to get the house a little neater and more orderly. And I hope it keeps raining, but gently. Our mountains need snow and our aquifers need recharging. The gardens of our lives all benefit from a little water blessing at regular intervals. Same kid, same arm, different bone. This time it’s something called a scaphoid bone, it’s a large-ish wrist bone just at the base of the thumb. Same-old, same-old… Not as bad as it could have been, but certainly annoying (and painful enough). Will trade slightly used stidkid for his weight in chocolate… 48 kg. no questions asked! Tuesday evening was not as I had hoped. But that’s okay, we’ll cope. When kid gets to the library where we work, I take one look at him (having been forewarned by one of the secretaries that he had asked to have his temp taken because he wasn’t feeling well…) and we leave. Get in the door not five minutes and he’s throwing up. 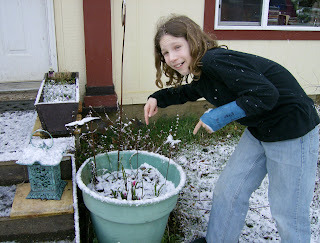 Today Mr. Blue Cast and I went to see how his arm is doing. Healing nicely, but the cast stays on for now. Another two weeks, they’ll X-ray again and probably take the cast off then. I am just as happy with the situation, it keeps him from overusing it and possibly hurting it in another fall before it’s strong. Better to do it this way than to have him rebreak and maybe worse. So the other kid and I spent the day resting, doing algebra and talking. I am feeling better (actually still tired, but not dragged out). I think the echinacea I took the last couple days has helped me avoid getting this particular nasty little bug. I hope. Now, to write an update on the story and think about dinner. Leftovers, anyone?